Yakusha Co. Ltd had 20 hours of footage at the end of production. The end result is 30 min. I sat through the film feeling challenged by a droning repetitiveness of its motifs. Experimental is the best way I could surmise its approach. Yet, it seemed to be adhering to a certain artistic discipline. And a very concerted effort as well. Its collaborators are 'Truly Asia'. The lead actor is Uichiro Fueda from Japan. 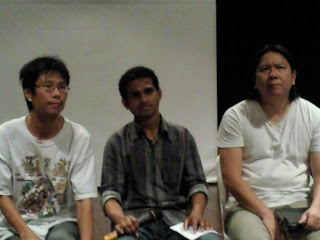 The director is Sreejith Ramanan from India and Baby Hee (camera and editing) is from Singapore. In a nutshell, Yakusha follows a veteran actor who is always practising hard for a big break in theatre that has eluded him. Constantly buried in his own world, he is running scenes in his head, hearing music in his brain and sub-consciously succumbing himself to a compulsion to act (rather tragically). The type-writer style scrawling of text across the screen helps us understand the inner currents of his mind. Otherwise, the film would be a cryptic installation art performance captured on video (and just to clarify, not an installation art video). Apparently, the 'Butoh' like theatrics of Fueda is an interpretation of King Lear, an easy classic that is transferrable culturally. The attempt hovers between being bold and indulgent but seems to tilt more towards indulgence. While it unabashedly challenges the audience to a appreciating something of an acquired art form, there is often more repetition then invention in its execution. To certain extents, there moments that seemed like a formula with Fueda seemingly trapped by the genre. Yakusha Co. Ltd is a zero budget digital production by a group of artists from various Asian countries. 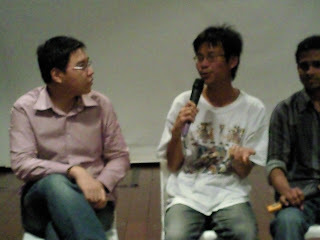 This short film is directed by Sreejith Remanan, a young theatre artist from India collaborating with Baby Hee, an experienced artistic collaborator from Monsoon Asia Art Gallery, Singapore (Camera and Editing) & Uichiro Fueda, a veteran from the Japanese instrumental acting practice (Main Lead) who shapes into a stand actor & Gokul Alex from India (Screenplay).